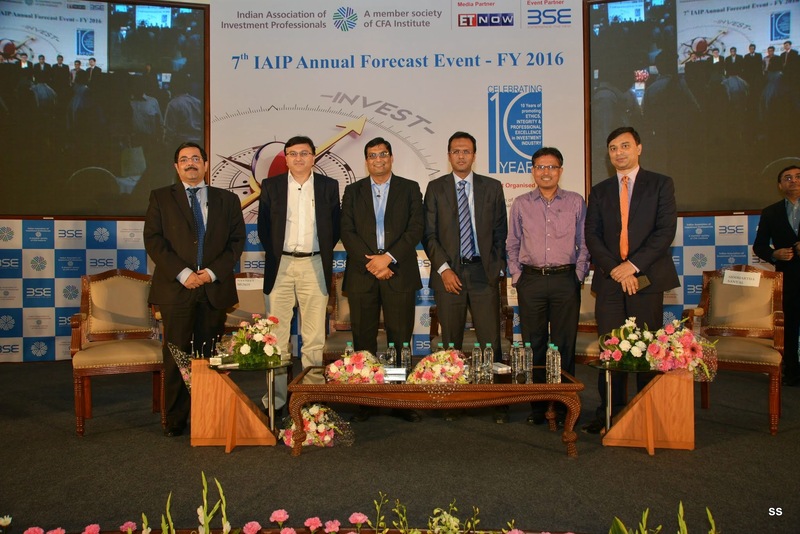 The Seventh IAIP Annual Forecast Event was inaugurated by Kishor Bagri, CFA, Director IAIP. Kishor spoke about the current global issues including economic as well as geo-political. He mentioned that domestic situation looks much improved referring India as a shining member of the BRIC nations. With India getting out of policy paralysis, it is aache din for Equities. Jayesh Gandhi CFA, President IAIP continued with detailing the efforts taken by the IAIP in terms of financial literacy and educating the investor community at large. He also thanked all the participants for making this event a success 7th time in a row. Nayan Mehta, CFO – BSE termed India as the hottest destination with government looking to boost the investment sentiment, GST expected soon and building relationships through foreign policy. He mentioned the BSE market capitalisation has crossed INR100trillion and is committed to creating wealth for India. BSE has launched SME exchange, Derivatives and Interest rate swaps and has become the fastest exchange in India. Excerpts from the panel discussion were as follows. Even though the sentiment is positive and inflation is going down, the biggest driver for the markets going forward will be corporate earnings. Next couple of quarters would be poor for corporate earnings and conviction of the investors would be tested. September quarter’s results will be critical and would define further market moves. Markets have rallied well in the past one year and quality stocks are very expensive reducing the margin of error. 24% of the stocks are owned by FIIs, and India has the highest allocation in the emerging market basket. Akash feels that from here domestic investors would drive the markets. He would be comfortable avoiding PSU banks due to their capitalisation issues and would focus on capitalised NBFCs and old private banks which are trading at a discount. Real estate is in a very bad situation and money locked in is expected to move to equities. It is a myth that global sectors such as IT and Pharma have outperformed. If fact private banks and infra companies have also performed well in this recent rally. Investors prefer to sit in their comfort zone which has led to over valuation of a certain section of the market. Nilesh believes that market reacts in anticipation of the critical news but takes the actual news in its stride. Market shivered in anticipation of the Fed quantitative easing but was up when it actually happened. A similar situation would play out when Fed hikes interest rate. In 2005 (start of a bull run), interest rate differential between US and India was 2% whereas today it is 5.5% hence there is no reason for us to worry about the narrowing gap. Land acquisition bill which has not been passed yet is most critical to boost industrial growth. Nilesh believes market might correct temporarily but will bounce back and has cautioned against buying companies with highly leveraged debt, poor governance standards and earnings growth rate lower than p/e ratio. Navneet also believes that corporate earnings will drive the markets going forward. Macro economic indicators are a lot better and will start reflecting in numbers very soon. Government will spend a lot of money in the next two months which will start the economic cycle. States, competing with each other for industries and development is a good sign. Industrial manufacturing space would benefit from a reversal in investment cycle but the focus should be on companies with operating leverage rather than financial leverage. With $10bn inflows in last 10 months, DIIs would be in a position to support the market in case of any correction. Moreover there is an increasing need felt by savvy investors to switch their investments from real estate to equities. Disintermediation, digitization and stricter regulation would affect financial services and digital finance would be the future. With government pushing reforms, Navneet likes PSU stocks along with agrochemicals. With macros improving, market could be seen as two halves. The first half has a premium of 15% while the second half is 20% cheaper. Market is discounting pickup in growth and the expectation is similar to 2005 which was the start of the bull-run. Commodity cycle would work in India’s favour, freeing up money that domestic investors could bring to the markets. For example the drop in oil prices was estimated to bring a net saving of about $50bn out of which $12bn was taken by the government but the rest was being passed to the corporates and the public. Declining commodity prices would help the supply and the market could settle at higher demand-supply equilibrium. On sectors, Prabhat expects the turning macro to benefit financials but is wary of a bubble being formed in the ecommerce sector. The hygiene factors such as Current account balance, Inflation, Interest rates etc have been sorted but confidence in the capex oriented sectors is still sagging. Current set of policy decisions have been in the right direction with focus on augmenting supply rather than controlling demand. Higher allocation to states will better target the GDP growth since states would be in a better position to decide on the priority issues. Global challenges would always be a risk but India is in a better shape as macro and micro factors continued to improve. He estimated the GDP growth to be about 7.8% and expected growth to pickup in six more months. Amit Khurana, CFA concluded the event with a vote of thanks. This entry was posted in Annual Forecast, Events, Mumbai and tagged Akash Prakash, Amansa Capital, Amit Khurana CFA, Barclays India, BSE, Chetan Shah CFA, Jayesh Gandhi CFA, Jayna Gandhi CFA, Jitendra Marchino CFA, Kishor Bagri CFA, Kotak Mahindra Asset Management, Kunal Sabnis CFA, Namit Arora CFA, Navneet Munot CFA, Nayan Mehta, Nilesh Shah, Nomura India, Prabhat Awasthi, Rohit Rebello CFA, SBI Mutual Fund, Shreenivas Kunte CFA, Siddhartha Sanyal, Sonia Gandhi CFA, Vidhu Shekhar CFA. Bookmark the permalink.